Still here, right now – Irish pop group Westlife hasn’t changed one bit, and we love it. EVERYTHING about Irish boy band Westlife is pretty much the same today as nearly 13 years ago, when the group released its first single Swear It Again. Well, almost everything – Brian McFadden left the band in 2004. Mark Feehily, 31, Kian Egan, 31, Shane Filan, 32, and Nicky Byrne, 32, have stuck to their nice-guy image and melodic love ballads, and over the years they’ve become known for releasing many reinterpretations of prominent songs. While audiences gradually lose interest in boy bands and power ballads, craving over-the-top costumes and high-tech multimedia visuals at live shows, you have to wonder what it is about Westlife that had a stadium full of people (mostly teenagers and youth adults) swaying and singing along to its songs at last Friday’s Gravity Tour concert in Kuala Lumpur. There were no back-up dancers, no special visual effects and no crazy costumes (although, the boys did change outfits four times), but you couldn’t ask for a better audience than the adoring crowd at Stadium Putra, Bukit Jalil. To manage to stay together and outlast most of its boy band peers and still receive that sort of hero-worship from fans young and old, you have to wonder what Westlife’s secret is. It also helps that the members have retained much of their boyish and playful charm while adding some adult polish to the equation in recent years. The group, now on to its 11th album (Gravity), is one of the few international acts capable of pulling off a 10-date Asian tour (spanning China, South Korea to the South East Asian capitals). Very much a box-office certainty, Westlife is no stranger to packed arenas. In some karaoke joints in Asia, Westlife also has its own songbook. Popular is an understatement when it comes to this group. “We’ve never changed our format, we do a lot of love songs and ballads, and people like that,” he added. Their winning game plan still works – the boys brought the house down (nearly 7,500 fans) on Friday night in KL with original hits like When You’re Looking Like That, World of Our Own, Safe, My Love and Beautiful Tonight. They showed us their funny side in a hilarious ‘Hits Medley’ segment when the boys donned Mickey Mouse T-shirts, sports jackets and jeans to sing and dance (badly) to Rihanna’s Only Girl in the World, Lady Gaga’s Bad Romance, Coldplay’s Viva La Vida and The Black Eyed Peas’ Dirty Bit. Between songs there was a lot of interaction – the boys took turns to talk to the audience about what the tour has been like so far, their families and what it was like to come back to perform in Malaysia after nine years. Ever the crowd-pleasers, it was the music that melted the hearts. The group also performed covers Seasons in the Sun (originally by Terry Jacks), Home (Michael Buble), You Raise Me Up (made popular by Josh Groban), I’m Already There (Lonestar) and What About Now (Daughtry). 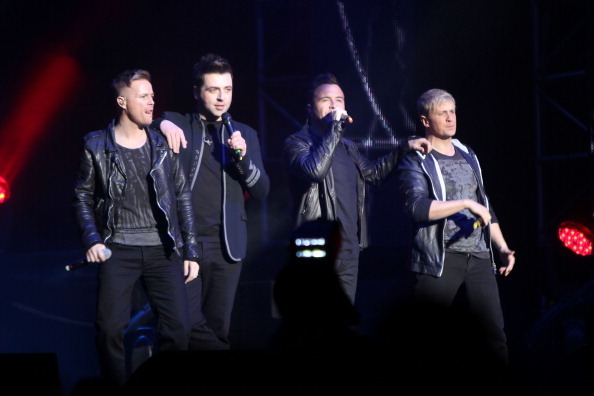 While the covers were highly entertaining, it was the original Westlife songs that brought the audience to their feet and near tears – yes, My Love (dedicated to a couple who got engaged right there on stage), Flying Without Wings, What Makes A Man and I Will Reach You, went down well with the masses. These power ballads, sung in perfect harmony in all their cheesiness were a clear reminder to fans (and critics alike!) as to why Westlife have stood the test of time and will continue to do so. For as long as people fall in love, somebody needs to soundtrack those feelings.